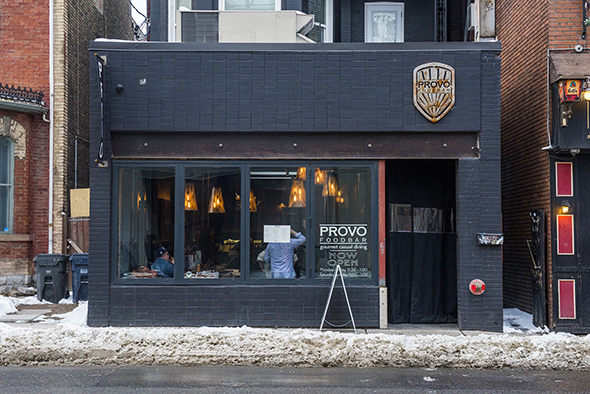 Provo Foodbar is an unassuming spot on Dundas West across from the AGO. From the outside it looks like a quaint single storey restaurant dwarfed by Frank Gehry's gorgeous building, but inside it's actually a massive food hall. 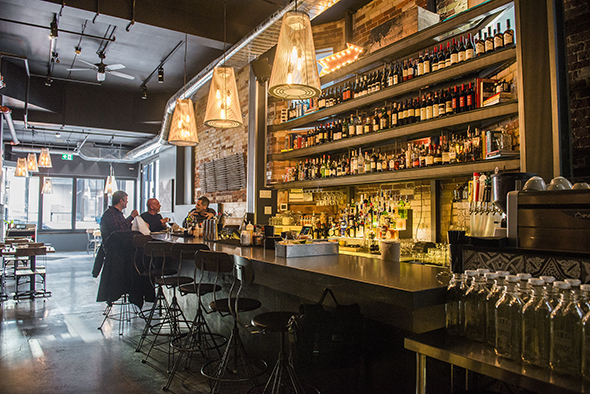 Owner John LaGamba has capitalized on a space that extends deep towards the back. 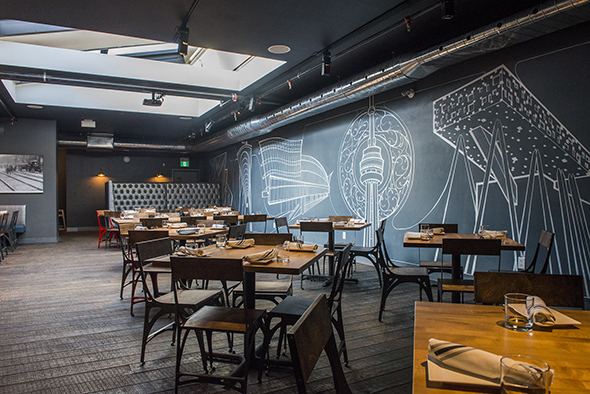 High ceilings, raw brick, and steel beams give the room an industrial feel while raw edge walnut tables and illustrations of Toronto landmarks warm it up. The restaurant takes its name from the Italian verb to try and carries the concept through to the menu. The idea is that every order is best shared by a pair of diners, and many of the dishes are two-bite sized, influenced by Italian, French and Mediterranean cuisines. 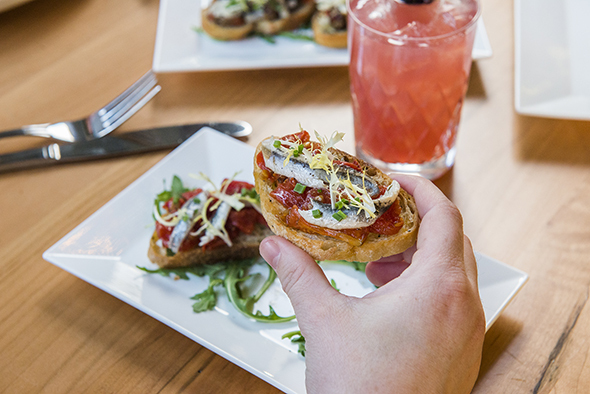 To start, there's a half a dozen types of crostini served two at a time on slices of house baked baguette from former Thuet protege, Danny Duckett. The tiny toast comes topped with things like white anchovies and oven-dried tomatoes ($5), navy beans with ricotta ($4), and eggplant caviar and shaved parm ($5). 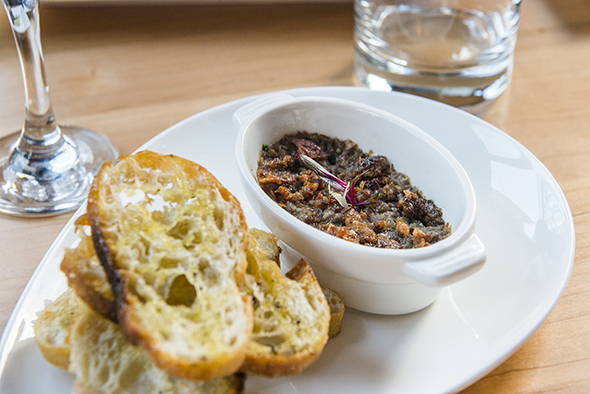 Also on the list of crostini is a crackling topped duck confit rillette ($6) presented in a tiny crock and meant to be spread over toasts like a gamey brown jam. 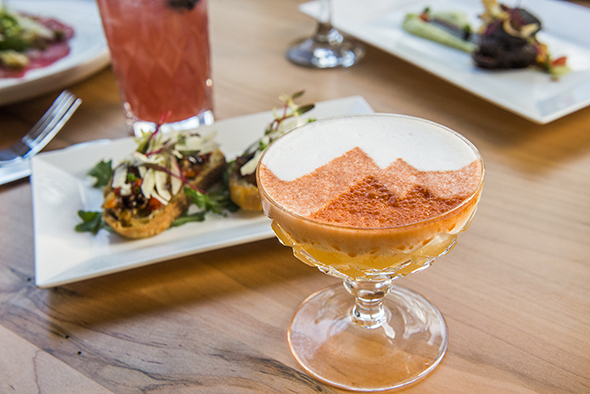 A couple orders of crostini and a cocktail like the frothy Honey Hazel ($10) with Frangelico, cayenne, honey and lime seem ideal for a first date (you know, like when you're not sure if you'll stick around for dinner). If cocktails aren't your thing, you'll find craft beer on draught starting at $6.25 for a 16 ounce pour. Oyster ceviche ($9) marinated with yuzu and sweetsop and mixed with chopped avocados isn't my favourite. 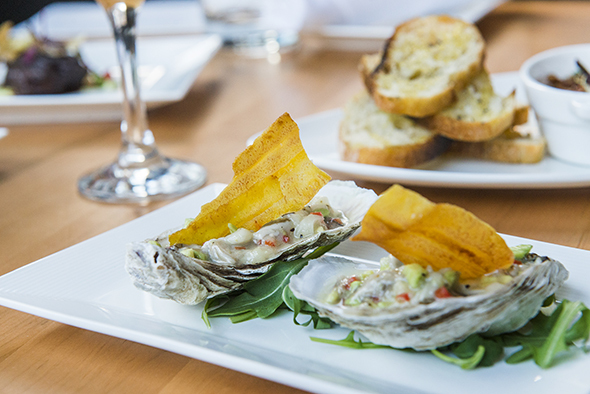 The flavours are decent but the texture of chopped oysters isn't something I savour. The restaurant acknowledges that not every dish will suit everyone. The prices and portions encourage sampling without diners being required to commit to a single entree. 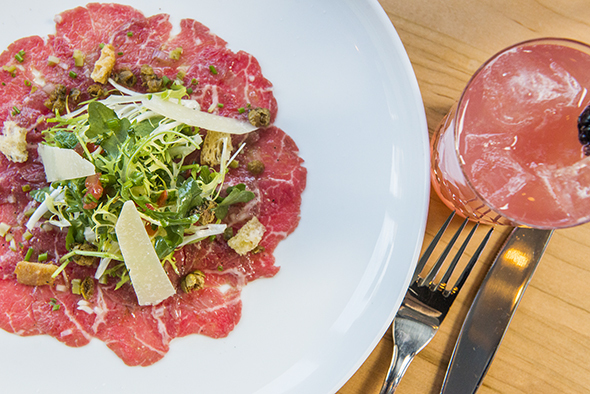 The beef carpaccio ($11) is more up my alley. It's hardly seasoned but garnishes like fried capers, finely diced cornichons and croutons step up to deliver salt, acid and crunch in all the right ways. The orzo jambalaya ($9), braised beef cheek ($12) and branzino ($11) are all portioned similarly to the starters. This really is a food bar , where the idea is to order many small dishes. 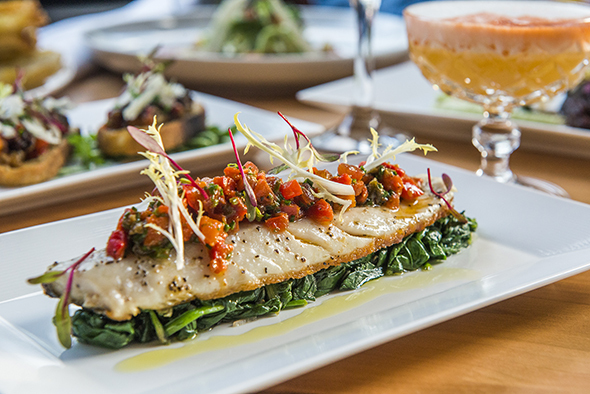 Thankfully these small plates are big on flavour. 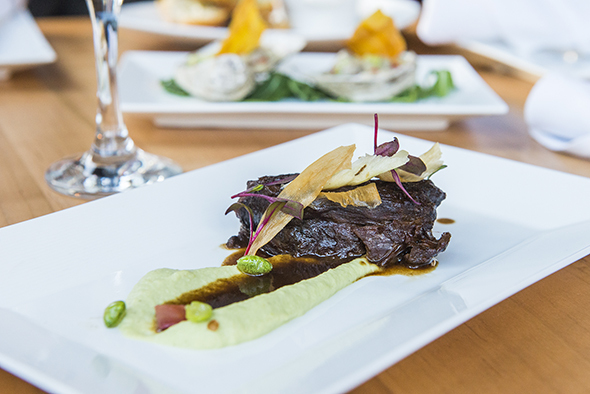 That braised beef cheek for instance comes laid over a swoosh of edamame and celery root purĂŠe sauced with veal pan jus and finished with a fried horseradish root chip. I can see this place being a popular stop-over when visiting the art gallery, and also as ideal Tinder date destination. It's the kind of place where you can plan for just a quick nibble and a drink before making any commitments.